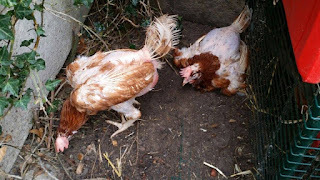 The Vegan Craftivist: Keeping the Hens Warm! Fellow crocheters/knitters, I just wanted to introduce you to two lucky ex-battery hens adopted by a friend of mine. I say lucky because they are lucky not to have the same fate as the majority of hens used for eggs that never get to a safe and happy home. My friend adopts rescued hens each year if she has the space. These ladies, and about 4 others that will be arriving in the winter, are the reason that I am currently making hen sweaters. Making something to help keep them warm while they recuperate is craftivism. Part of the idea of craftvism is to reach out and help an individual through craft. It may not make a difference to the millions of hens living awful lives in farms, but it does make a difference to these individual lives. I hope you will reach out to any friends that rescue non-human animals and ask if they may need a hand. You would be surprised just how much support you can give just by donating through the simple act of creating. If anyone would like to lend me a hand making sweaters, then let me know.